The Scots loved relays – sprint relays, Mile relays, mile medley relays, 4 x 100, 4 x 110, 4 x 220, 4 x 440, – anything that started on the programme with 4 x … was eagerly looked forward to. Of them all, it is suspected that the medley was the most popular consisting as it did of short sprints, long sprints and middle distance specialists. It is surprising to note then that although the SAAA was established in 1883, the first medley relay championship was held in June, 1919. Came the day and the new champions in a close finish were Maryhill Harriers with a team of G Dallas, H Goodwin, G Hamilton and S Colberry in in 3 minutes 55 seconds; second was Greenock Glenpark Harriers (Sergeant Hector Phillips, HD Soutter, JK Neave and AR Bollini. It was noted that ‘also competed’ were Bellahouston Harriers and Glasgow University. Three of the entered teams did not turn out, the programme suggested that it was because the relay took place at the very end of the programme, but it was nevertheless one of the most interesting relay races ever run in the district. 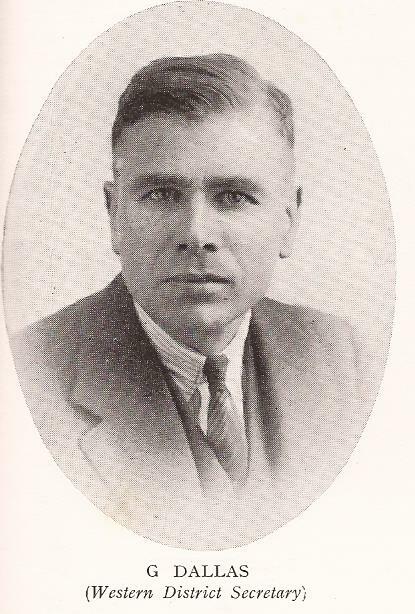 It should be noted that in the half mile, Sgt H Phillips won from G Dallas, Phillips had also been second in the quarter, Bollini, Neave and Colberry had taken part in the 220 and Goodwin, Bollini and Hamilton had run in the 100 which suggested that the event coming late in the programme was not really a reason for not turning out a team. Regardless, Maryhill were the first winners of the country’s relay championship. The following year a Maryhill team won again from West of Scotland in 3 minutes 47 1/5th seconds with three of the previous year’s winners out – the team was Dallas, Colberry, Goodwin and JB Bell. Dallas had already won the 440y, Bell third in the 220y and second to Dallas in the 440y and Goodwin and Colberry had run in separate races without picking a medal. Maryhill were to dominate the relay with Edinburgh University over the first eleven years in which it was contested. In 1921 Maryhill was going for a treble – two wins under their belt and a good team out that year as well. Could they do it? The weather was fine, the crowd at Celtic Park was approximately 5000 and the track was in good condition. Their team consisted of Dallas, Bell, Colberry and JW Riach. The treble was possible. Several of the relay men had run already: Liddell won the 100 yards and also took the 220 yards in which Colberry also ran, Dallas and RB Bell ran in the 440 yards. The winning time was 3 minutes 43 seconds. That was the first of a series of victories for the Edinburgh University students. In 1922 the only man from the previous year to line up for them was Liddell and they won in 3 minutes 40 seconds – a bit quicker than in the previous year. Held in Edinburgh in wet weather the report was brief to the point of dismissive: “Maryhill Harriers failed to regain the relay honour which they lost to Edinburgh University last year. It was not generally expected that they could field a team to beat Brown, Liddell, Dunn and IM Robertson and, as a matter of fact, they did not even get second place.” That is the report in its entirety. Second team was West of Scotland Harriers, Maryhill was third and Shettleston fourth.. The following year, 1923, though, it came down to the big two of relay racing again with the championship held at Hampden Park. “After winning the relay race for two years Maryhill Harriers have been outdone by Edinburgh University AC, who on Saturday , thanks largely to Liddell’s running on the second furlong, secured their third successive win.” The Edinburgh team of Brown, Dunn, Liddell and Morrison defeated Maryhill’s quartet of Harrison, Davidson, Burns and JG McCall by five yards in 3 minutes 43.6 seconds. In 1924 the title was really up for grabs again because of the absence of Edinburgh University. 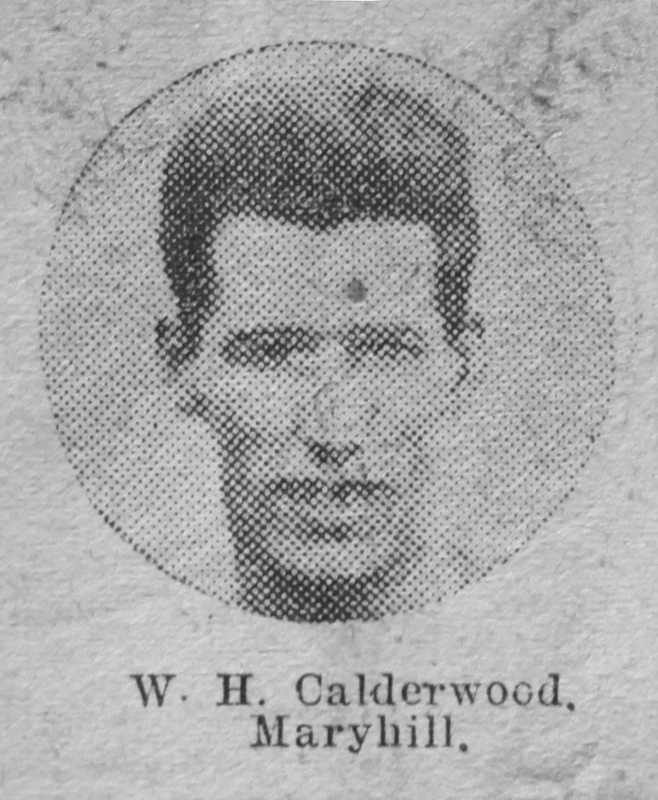 The 1925 championships saw Maryhill win back the title by two yards and also the first run of the excellent Walter Calderwood in the championships. They won by five yards from West of Scotland Harriers. Their team being Calderwood, Duncan, Anderson and McCrae as against the West squad of McIntyre, Burns, Walker and Hope. Edinburgh University (Finkelstein, Watson, Osborne-Jones and Knipe), Glasgow University (Milligan, Robb, ? and Graham) and Glasgow High School (Riddell, Ward, McLean and McLaren) also ran and the winning time was 3:44. In the 1926 race five clubs competed and the race was won by Edinburgh University by fifteen yards from Maryhill Harriers in 3 minutes 41 3/5th seconds. The University team was led off by Hugh Maingay ,one of the founders of the Atalanta Club, and he was followed by RD Allison, AD McDonald and RB Hoole, while Maryhill was represented by LS Campbell, CH Cowie, DC Duncan and AH Graham. Allison had already won the 220 yards and been third in the 100, and Hoole had been a close second in the 440 yards. Other competing teams were West of Scotland, Glasgow University and Edinburgh Harriers. Earlier in the afternoon, Hoole had won the 440 yards, Hope the half mile and D Maclean the Mile. The Maryhill team, already named, won by three yards in 3 minutes 45 3/5th seconds from Edinburgh University’s team of HC Maingay, RD Allison, AD McDonald and RB Hoole. Glasgow University and West of Scotland Harriers were the only other teams forward for the race. EUAC 4 x 440y Relay team, Hugh Maingay on the left. 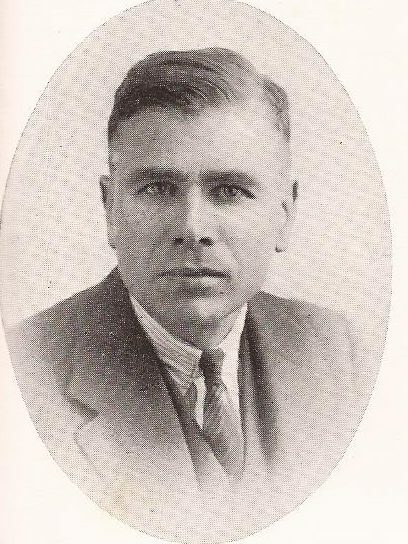 In the lead up to the relay at the SAAA Championships in June 1928, HC Maingay of Edinburgh University ‘justified all the good things that had been said about him’ by winning the 880 yards title from Donald Maclean of Maryhill Harriers, who later won the Mile. 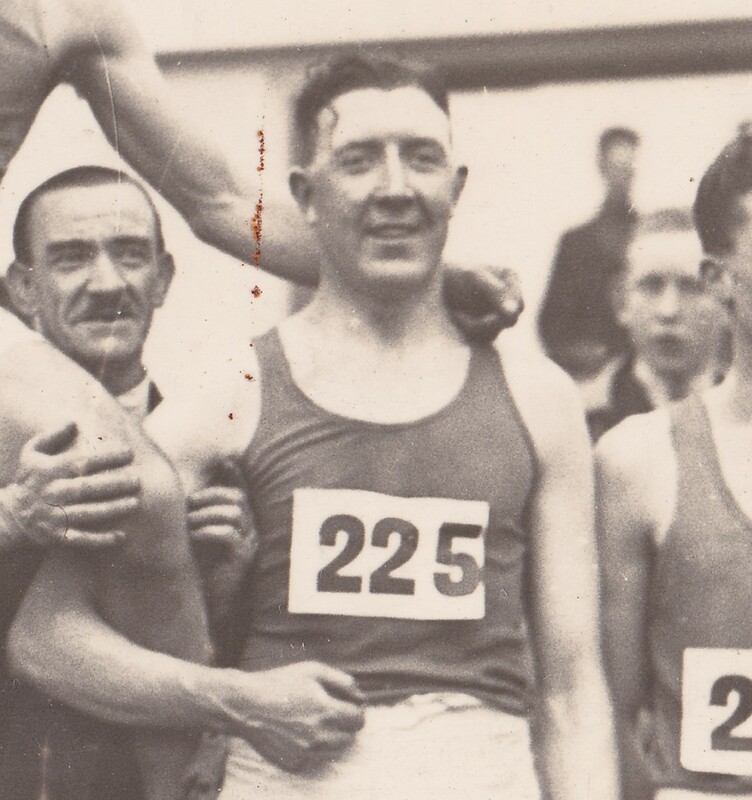 Even although Maingay won in a time much below his best, and Maclean had a very easy task in the Mile, a hard race was envisaged when they faced each other on the half mile starting leg of the relay. However reports tell us that he relay race was notable for the fact that Maingay again defeated Maclean over the half mile distance’. That distance was not decisive and Maryhill won with a team of Maclean, WP Andreioli, A Kennedy and AH Graham. The EUAC team of Maingay, FP Reid, RD Allison, and D Paton finished a mere five yards behind the Maryhill squad who returned a time of 3 minutes 41 3/5th seconds. 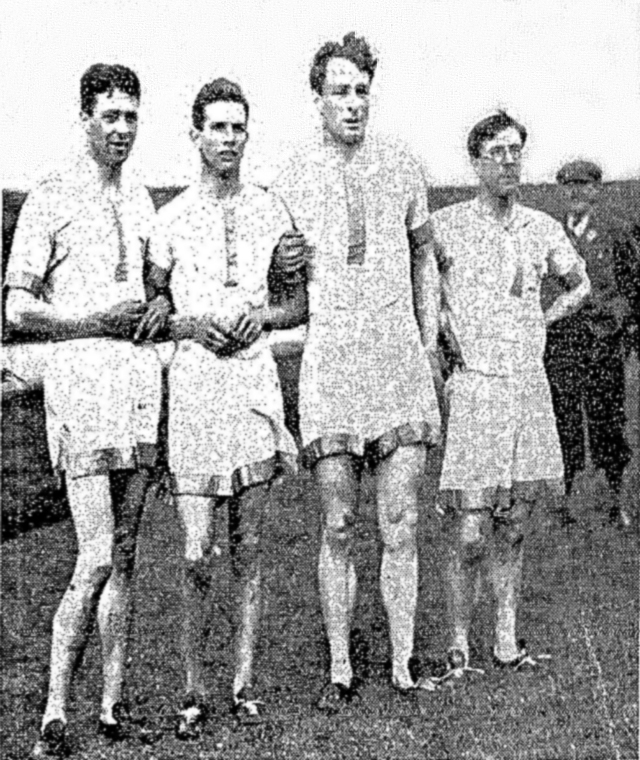 The Glasgow Police Sports were held at Ibrox the week before the SAAA Championships and one of the attractions on the programme was a Mile Relay – a good run-out for teams the week before the National Edinburgh University had a good team out with Hugh Maingay, in excellent form with several outstanding runs to his credit already, ran the half mile against J Calder of Beith ‘who had shown himself the best of the West half-milers’ he was timed at 1:59.0 and finished his stage only eight yards in front of Calder. 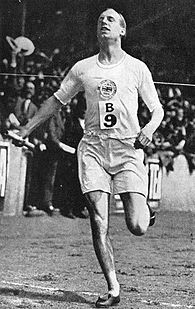 The University advantage was added to by Paton and the race was practically over when Howland took the baton. FP Reid ran the quarter for them and they won in 3 minutes 50 seconds, 15 yards in front of Beith. Howland was the subject of much discussion on his eligibility since he had run several races for the Achilles Club that season. Beith Harriers, based on that and other performances were thought to be in with a chance of winning the SAAA Mile Medley Relay when it was held on 22nd June at Hampden Park. In the National the situation was different of course. eg where the relay men had almost all raced before that event on both weekends, the standard was much higher at the National. Maingay won the half-mile comfortably, Maclean had lost a lot of his form and was second in the mile and did not run in the relay being replaced by WH Calderwood who had already won the Mile and Calder was out f the medals in the 880y. These three were representing their club in the half mile leg of the relay and Maingay was the ‘winner’ with Calderwood second. Edinburgh went on to win with the team being completed by D Paton, RL Howland and FP Reid, by 10 yards from Maryhill (Calderwood, T McLean, AD Turner and HH Devlin) and West of Scotland (C Freshwater, JG Scott, W Taylor and AF Clark). Beith? They were fourth with Shettleston last. The winning time was 3 minutes 43 3/5th seconds. Introducing the relay to the championships had been a great success. There had only been two clubs who had ever won the race in its eleven years but there had been many excellent races and there had been challenges from other clubs, notably West of Scotland, but the title had been swapped between Maryhill and Edinburgh University. It was not a pattern that would remain throughout the 1930’s.